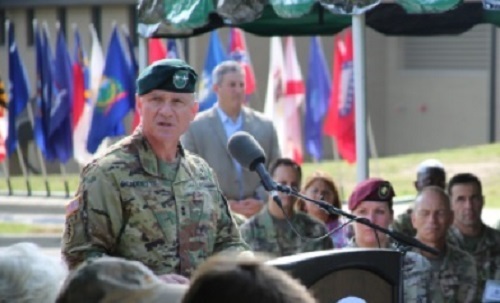 MG Francis Beaudette speaks during ceremony where he assumed command of the 1st Special Forces Command on July 28, 2017 at Fort Bragg, North Carolina (Photo courtesy USASFC). MG Francis Beaudette is the new commander of the 1st Special Forces Command. He replaced MG James Kraft in a change of command ceremony held at Fort Bragg, North Carolina on July 28, 2017. MG Beaudette has served in progressively higher levels of command and responsibility in the special operations field to include SF company commander, SF group S-3 (with time in Iraq 10th SFGA), SF battalion commander (with time in Afghanistan 10th SFGA), and SF group commander (1st SFGA). 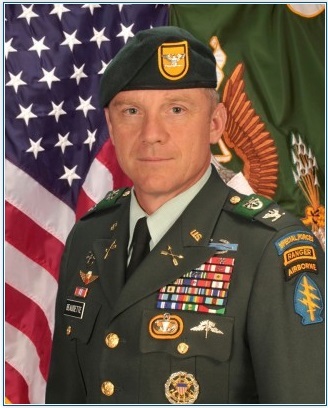 Past assignments for MG Beaudette include postings as assistant commander of support for Joint Special Operations Command (JSOC) and deputy commanding general of operations for the 1st Armored Division at Fort Bliss, Texas. His early days in SF started with 3rd Special Forces Group where he led two detachments, the Group Headquarters Company, and served as assistant S-3. He also served as aide-de-camp to the commanding general of the U.S. Army John F. Kennedy Special Warfare Center and School. MG James Kraft will move to the position of Deputy Commanding General, U.S. Army Special Operations Command, Fort Bragg, North Carolina. Much of his two-year assignment with the 1st Special Forces Command was spent overseas. Read more in a news report by the Fayetteville Observer, July 28, 2017. “Officers get new assignments”, The Fayetteville Observer, June 7, 2015.